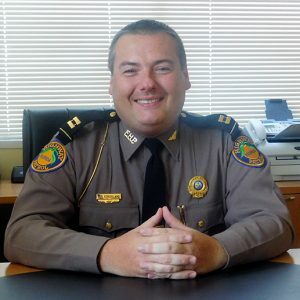 Welcome to Troop L, the Florida Highway Patrol’s 3rd largest Troop. Troop L Headquarters is located on Florida’s Turnpike at the 94 Mile Post Service Plaza in Lake Worth, located in Palm Beach County. Strategically located, we are conjoined with the Lake Worth Regional Communications Center, a state-of-the-art communications facility that dispatches for Troop L, Troop K and other state agencies, such as Florida Department of Law Enforcement, Department of Environmental Protection, Motor Carrier Compliance, State Fire Marshall, Alcoholic Beverages & Tobacco and the Department of Agriculture. Our facility is also home for dispatchers from the Florida Fish & Wildlife Commission. The LWRCC coordinates its efforts in conjunction with the Florida Department of Transportation’s Intelligent Transportation System that oversees the Florida’s Turnpike, which is also housed in our facility. 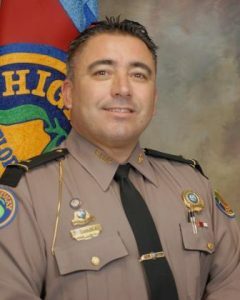 The Florida Highway Patrol is committed to creating “A Safer Florida,” and Troop L is leading the way by “Providing Highway Safety and Security through Excellence in Service, Education and Enforcement.” Our men and women patrol nearly 225 miles of interstate and thousands of miles of state- and county-maintained roadways daily, ensuring that residents and visitors to the Treasure and Gold Coasts – and beyond – are protected and kept safe 24-hours a day. Troop L has a reputation of “Courtesy, Service and Protection,” and we are committed to continuing this long-standing tradition. If you observe an aggressive or impaired driver, a crash, a disabled motorist, or any other highway-related matter that needs immediate law enforcement attention while you are traveling in our beautiful area, then call us by dialing *FHP (*347) on your cellular phone. Please drive carefully while you visit our area. Your safety is important to us! The Lake Worth District serves Palm Beach County with a population of 981,793 and over 900,000 licensed drivers. This County has beautiful beaches on the east coast stretching for over 45 miles, which lures over 3.5 million tourists a year. Among the beaches, Palm Beach County is the host to theatrical, and sporting events at several arenas, stadiums, and golf resorts throughout the county. In addition, the main agriculture crops of sugar cane bring both migrant workers and increased commercial truck traffic during the months of January through May. In the western part of Palm Beach County lies the second largest lake in the United States, Lake Okeechobee, which is 730 sq. miles and offers great freshwater fishing. The Main Street of Palm Beach County is Interstate 95 which runs the entire length of the county. 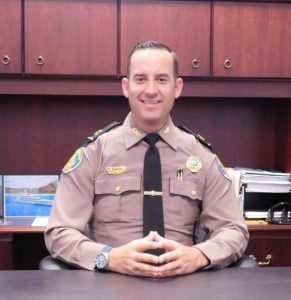 Lake Worth District has 1 Captain, 2 Lieutenants, 7 Sergeants and 40 Troopers. Known for the vast amount of treasure just off shore in the beautiful Atlantic Ocean, the Ft. Pierce district includes 2433+ square miles which consists of St. Lucie, Martin, Indian River and Okeechobee counties. There are 37 uniformed personnel assigned to this area of which 7 are supervisory personnel, 6 are traffic homicide investigators, 2 are felony team members and 22 are road troopers. The area recreational activities include both in shore and off shore sport fishing, skin and scuba diving plus boating and fishing on the Indian River. Diving for treasure is also a popular attraction with all the sunken ships off our coast, hence the name “Treasure Coast”. An abundance of regulation golf courses are spread out over our four county area for those interested. St. Lucie County is known for its old heritage of pineapple plantations and bountiful citrus groves. The New York mets call this area home during spring training. Total population of St. Lucie County is 186,315 with 147,020 registered vehicles and 149,315 licensed drivers. Indian River County citrus is world famous, boasting some of the best grapefruit and oranges on the market. In early spring you can catch some of the local festivals such as Fellsmere Frog Leg Festival and Indian River County Firefighters Fair. All during the year many arts and crafts shows and antique shows are held with local and out of state vendors participating. Total population for Indian River County is 107,067 with 93,011 registered vehicles and 94,680 licensed drivers. Martin County is the Sailfish Capital of the World with many opportunities to test your skill in this sport. Festivals in the area include October Fest and Jensen Beach Pineapple Festival which is held in early November with famous name entertainment on hand. Total population for Martin County is 120,617 with 118,936 registered vehicles and 111,504 licensed drivers. Okeechobee County encompasses 774 square miles and is the home of the second largest freshwater lake (730 sq. mi.) totally within the confines of the United States. Beef cattle ranching is the county’s oldest industry. Okeechobee County leads the state with 133,000 beef cattle. Okeechobee also leads the state in dairy cattle with 32,000 dairy cows. These cattle produce an estimated 54,688,000 gallons of milk every year. Total population of Okeechobee County is 35,439 with 33,795 registered vehicles and 29,401 licensed drivers. The Davie District serves Broward County. Broward County has a population of 1.8 million. Broward County is 1,197 square miles, with 23 miles of Atlantic Ocean stretching between Palm Beach County on the northern perimeter and Dade County on the southern. There are 1,322,468 license drivers. Two thirds of the western part of the county has approximately 505,009 acres of Everglades. Broward County has a host of activity ongoing year round some are golfing, fishing, boating, tennis, diving and cultural events just to name a few. Broward County is also the home of the Florida Panthers Hockey Team. Troopers assigned to the Davie District are responsible for patrolling Interstate 95, Interstate 75, and Interstate 595. Davie District has 1 District Captain, 2 Lieutenants, 6 Sergeants, 4 Traffic Homicide Investigators, 37 Troopers and 3 Senior Clerks. 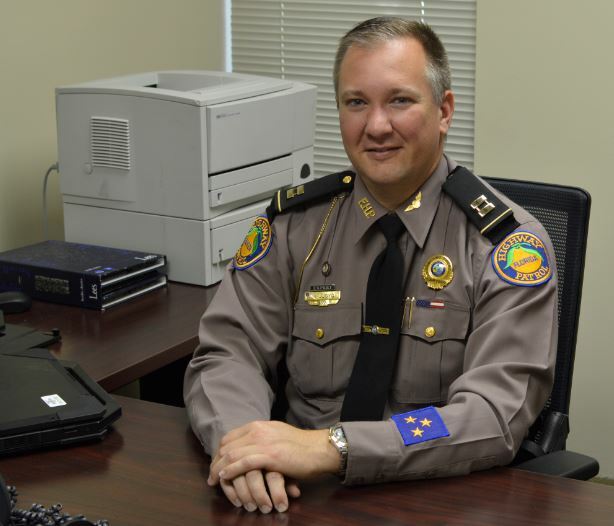 The Troop L Office of Public Affairs is responsible for providing information to the public, responding to inquiries from the statewide news media, conducting traffic safety programs, and managing various highway safety programs. Request for traffic safety program presentations can be made by contacting Lt. Alvaro Feola at 954-308-5929 or E-Mail AlvaroFeola@flhsmv.gov.